This is where Pay Rate Templates come into play. Similar to the Leave Allowance Templates feature that we released earlier this year, Pay Rate Templates enable you to create pre-defined sets of pay rates which can then be applied to new and existing employees. This will show you a list of the existing Pay Rate Templates and will display the number of employees that are linked to that template. The pay rates that are not applicable to this template may be disabled – as you can see in the screenshot above, we have disabled the “Available for duty allowance” pay category. ..or existing employees (via the “Pay Run Defaults” or “Pay Rates” pages in the employee settings). 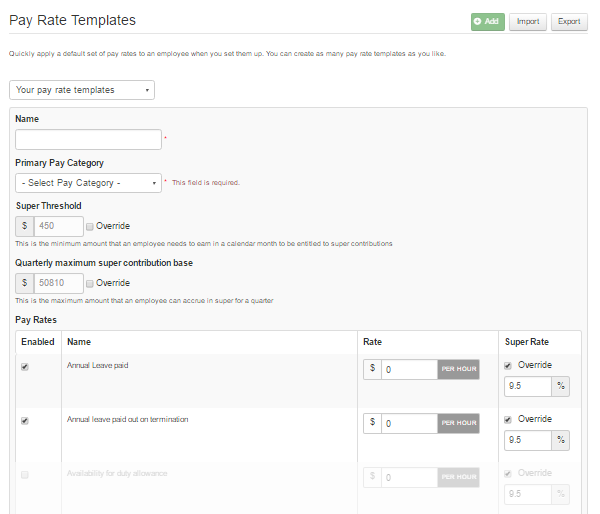 Once a Pay Rate Template is selected, the rate and primary pay category for that employee are assigned automatically. Opening up the Pay Rates page for this employee, we will see that he/she is now linked to the Pay Rate Template. The padlock indicates the rates that are linked to the template. If we decide to change one of the linked rates for this employee, they will be disassociated from the template. To assist with employees whose pays must be reviewed/updated on their birthday, we’ve also introduced a new “Employee Birthdays report”. This can be found in the “Reports” section of the site. This report will inform you about which employees are having birthdays within the specified date range so that preparations can be made to adjust their pay rates (and buy birthday cakes!). Pay Rate Templates should be a huge time saver for medium to large sized businesses. Maintaining a set of rates in one place and then applying them to employees will also reduce data-entry errors, ensuring happy (and correctly paid) employees!